There's previously been some discussion about E61 grouphead thermometers but I haven't found specific mention of TheBat device version. Nothing ground-breaking about the design, just a different take on mounting to the grouphead compared to "Eric's device" which uses a modified Swagelock compression fitting to seal against the thermometer probe. With his, the tip of the thermometer is directly exposed to water in the grouphead when it is flowing. The downside however is the aesthetics. Thebat device uses a modified hex head cap screw, (similar to what you remove to install this one), which has been blind drilled for a tolerance fit of the thermometer probe. The last few mm have been turned down externally creating a thinner tip for quicker heat transfer. This modified screw "thermowell" has thermal paste applied internally before installing the thermometer probe to ensure the best possible heat transfer. In effect it's the same as Eric's device just with an additional thin layer of metal over the thermometer tip. Sensitivity would be near identical. The big benefit is that the overall installation is a lot neater and less obtrusive. It looks like the original screw-head with a short length of probe and smaller thermometer head on it. Just a mention regarding cost. Both Eric's device and Thebat device seem quite expensive for what they are. As they aren't mass produced, the price reflects the effort involved. There is a fair bit of manual labor involved in modifying the length of the thermometer probe and also the mounting components to suit. The thermometers in themselves aren't expensive its just the labor component that determines the price. Anyway, first impressions are mixed. I always start machine warm-up by running water through the grouphead and then lowering the lever to the middle position (not fully lowered to drain). This leaves water rather than air gaps in the grouphead which I believe helps with quicker and more even heating. Its early days but I've come to the conclusion that temperature readings are only indicitive and not accurate when there is no water flowing in the grouphead. Part of the reason for this may be explained by the image below. What are referred to as "Infusion channels" in the image are shown to rise towards the "plug" (which is replaced by Thebat device mounting screw) and then fall towards the "Dispersion screw" (diffuser). I believe that when there is no water flow, the water drains out of the falling section of the "Infusion channels" leaving the tip of the thermometer or thermowell just short of the water in the rising section. There will still be radiated heat from the surrounding metal but you won't get a true water temperature at rest. However, when the E61 grouphead has been given time to fully heat-up, the temperature displayed is closer to the brew-water temperature. You see much less variation between rest temp & when brew-water is flowing. It takes the initial couple of seconds of flowing water before actual water temp is displayed but you learn to allow for this. The closer to optimal grouphead temp, the less time it takes. On my machine (Vibiemme E61 Single Boiler), once past this, I have about 0.5 deg C variation over the 25-30 sec brew cycle. I still flush 3-5 secs before brewing depending on how close to the previous heating cycle it is. If insufficient (slightly) heat-up time has been allowed, the temperature will fall 2-4 deg C during brewing which isn't desirable. At the moment I'm experimenting with controlling temperature in the 2nd shot as I sometimes see a 2 deg c rise if brewed too soon after re-heating occurrs following the 1st shot. I found Thebat device has given a better insight into the timing of grouphead heat-up and also timing requirements between shots. Originally I set the machine thermostat to 93 deg C using a multimeter and bead thermocouple as water exited the shower screen. Yet to compare the 2 readings but on the to do list. Last edited by CafeLotta; 11th June 2018 at 02:31 PM. Photo of Thebat device thermometer installed in Vibiemme E61 grouphead. Following a PM from a CSer, a little additional information is added here. "The batdevice" is/was made by a coffee enthusiast from Denmark in a "cottage industry" style situation I gather. I'm not sure of the current status of further supply. I haven't found these or similar devices sold by anyone directly who is located in Australia. It appears he does them in batches and originally sold them via a Danish Coffee Forum - Sælges "Thebat Device" - Tag temperaturen på din E61 (you need to right click and select translate to English). They were also sold via Ebay.de. I bought mine from Ebay.com.au. It was listed as the last one in that particular listing and as of today there is no re-listing. Price was around $130AUD landed here which is less than "Eric's device" from the US - https://www.chriscoffee.com/e61-digi...r-p/sss-04.htm. A couple other variants I found in my travels are linked below but I know nothing more about them. PS - I have done a quick test comparing the Grouphead thermometer to a bead thermocouple and multimeter (as best as you can) under the shower screen with brew water running and found 1-2 deg C lower under the shower screen as you would expect. I seem to remember 2 deg mentioned elsewhere as the variation between the two. Last edited by CafeLotta; 14th June 2018 at 12:44 PM. Thanks for all the information. Do you plan to leave the bat device in permanently or just for testing? Ps Any idea why you can't have English as a first language to produce these devices? Yeah will be leaving it in permanently for now. Its interesting how addictive it is playing around with different forms of flushing to try to speed up the heating phase of my older VBM E61 single boiler. Turns out I was pretty close to the mark before installing the thermometer. On my machine, the standard 40 min heat-up came in a bit low on temp without flushing some hot water during this time. The market probably isn't big enough here to produce these commercially and America has Eric's device. I think we're too accustomed to click and buy where there are no borders! Also the results from these thermometers aren't absolute and need a bit of interpreting I feel. You need a couple of seconds of running brew water before any useful reading appears. Probably not suitable for the majority of people who just switch on and wait 40 mins. Last edited by CafeLotta; 14th June 2018 at 06:06 PM. I believe that when there is no water flow, the water drains out of the falling section of the "Infusion channels" leaving the tip of the thermometer or thermowell just short of the water in the rising section. Found an image which shows more clearly how these type of thermometers mount and better explains my comment above. I'm currently building a combined thermometer / pressure sensor that screws into the m6 thread on an E61 group to enable me to test something else I dreamt up. Mine interfaces with an industrial PLC (because the thing I dreamt up is PLC controlled anyway) but it would be simple enough to give it a dedicated readout. I'll post some info when it's built and tested. artman and Paolo like this. Spotted this Isomac Dual Boiler that comes standard (?) with a pressure gauge mounted in this location. I was always under the impression that a pressure gauge measuring liquid should be mounted in a location where air can't enter the gauge (low point). Air compresses, water not really. Maybe the relatively low pressure and minimal air pocket don't really affect the pressure reading to any large degree. This location on the grouphead is at a high point in the brew water circuit and also appears to drain so I can't really see how an air pocket doesn't form at this high point. When brew water is flowing I'd imagine the majority of air is pushed through. Pressure is distributed force so it doesn't dissipate. If you have a look at the pressure gauges on any standard machine you'll notice they have pigtails between them and the boiler(s). These serve to prevent water ingress into the Bourdon tube in the gauge by maintaining a column of air / steam as a buffer but allow the system pressure to be transmitted to the gauge. This slows down the response of the gauge but it will reach equilibrium eventually. Since the pressure fluctuations I wish to measure are fairly slow I believe the same principle will apply when I mount the pressure sensor to the grouphead. I'll soon find out if I'm wrong. What i want to add is that this look awesome and I would love to buy a temp gauge that Isn't a cheap plastic digital display. Who wants that front & centre of their machine? Personally, I don't have an issue with the aesthetics of TheBat device as its quite small and unimposing. Eric's device has a larger mounting fitting as well as a slightly larger gauge head. The most important part of these setups is that the fitting mounts the gauge tip in close proximity to the brew water gallery near the grouphead as well as providing a water tight seal. After a few months using TheBat device on an E61 Single boiler (VBM), I have found it to be a useful (if not frustrating at times) addition. In effect its a tool that aids in Temp Surfing on an E61 non-PID machine. I came to the conclusion that with my Single Boiler it helped in developing a heat-up and flushing routine that kept brew temps under tighter control with more consistent and repeatable results. When I strictly adhere to this routine, displayed temps can be kept within 1-1.5 deg C during an extraction. The downside is that on my machine it doesn't take much variation from this routine to double this temp. 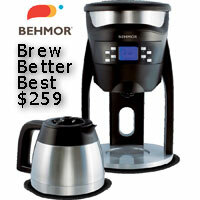 When I first started using the thermometer I had a tight brewing routine which I was using. This included 3 or 4 short (3-4 sec) flushes in a set time to try to have a quicker heatup. This was found to be OK but just a little short on time to get the temp ideal. I then started varying the flushes and totally confused myself when the temp dropped rather than increased as I had expected. Overheating the E61 grouphead also came into play along the way. I stopped using the thermometer for a few days and went back to my previous routine after being left a bit baffled. When I went back to experimenting I found that I needed to look at the heatup patterns overall rather than temps in isolation. Once familiar with the patterns from heatup to what happens during an extraction, the grouphead thermometer read-outs made sense. I managed to get hold of a used Eric's device which at some point will install and do a comparison with TheBat device. Hello and thank you for accepting us (me - Tudor) into the community. If you have any questions about our product (the one from Romania), will gladly help. We have send a request to the admin and owner of this great forum to let me post here and maybe to do some advertisement + send some sensors for testing, for some of you lucky ones. We already had some customers from AU + NZ so the product is not so new here. We ship worldwide and will make in the near future a good offer for 3 sensors with free shipping for the coffeesnobs.com.au community. Also, Coffee Sensor is involved in some talks with a big bulk supplier from AU, don't know if it is ok to post the name. We would like to have a big stock of the product in AU+NZ, so the shipping would not be such a big problem, although it takes only 7-10 days for the product to arrive in your location. Cheers and hope to see some feedback here and questions and even suggestions on how to improve the product. Welcome to CoffeeSnobs Tudor, as a Site Sponsor representing your CoffeeSensor product. So anyone used the Coffee Sensor? Interested in a group buy? (3 needed for free shipping). I'm willing to give it a go, and give me a bit more insight into what is happening at the brew head. Works about $80-ishAUD each, delivered. Made an interesting discovery today when tinkering around with a different type of grouphead thermometer. I was under the impression that the ideal mounting of a thermometer was with the tip in line with the edge of the water gallery that goes downward toward the water diffuser and shower screen as per the image. I discovered on my VBM that TheBat device has the sensor tip about 3mm past the bottom of this opening. May need to try an extra washer or 2 although it does seem to work ok as is. I made a simple gauge to measure the position of the opening as it heads downward. Did see this somewhere a while back. The gauge is a straightened paperclip with a tight fitting piece of insulation stripped off a wire. The hook end is carefully slid down the hole where the thermometer mounts, until the hook drops into the opening heading downward. Raise slightly until you locate the upper edge of the opening. Hold steady while you slide the insulation sleeve down the wire until it stops at the surface where the washer normally sits. This will give a dimension to be able to judge where the thermometer/thermowell tip sits. On the Vibiemme, there is 10mm between where the washer sits and the top part of this opening/gallery heading down to the diffuser/shower screen. The gallery seems to be around 2mm or so to the bottom making 12mm overall. TheBat mounting screw ia 15mm from the washer contact surface to the tip. My interest was in how "Eric's device" compared to the less expensive "TheBat device" and the even more affordable "CoffeeSensor" grouphead thermometer. Eric's device is quite expensive here in Australia as it needs to be shipped from the USA. I've only ever seen one used unit up for sale and grabbed it for about half the new price. In use it is quickly apparent that Eric's device is much more sensitive than both "TheBat device" and the "CoffeeSensor" which have similar sensitivity. The VBM E61 grouphead design seems to differ externally to some others and Eric needed to modify his mounting fitting early in development for clearance on the VBM. I had issues installing the current CoffeeSensor on my VBM needing 5mm of washers just to clear the grouphead and another 4-5mm of washers to get the probe tip near the correct position. CoffeeSensor are aware of this issue with the VBM and will be modifying their mount to suit in an updated version. Even though it was leaking due to all the washers, it allowed me to do a quick comparison of TheBat group thermometer to the CoffeeSensor. In use, these 2 appear to behave in a very similar fashion with a slight lag in updating temp when compared to Eric's thermometer. I'm still trying to decide if this slight lag is actually a good thing as it knocks off the highs and lows of displayed temps to a point. This stops the temp display fluctuating so quickly and eliminates displaying momentary temp spikes. After a week or so I'm still getting used to how sensitive Eric's thermometer is and tend to get distracted by the rapidly fluctuating temp display. Whether this degree of sensitivity is actually needed when brewing compared to the slightly less sensitive "TheBat device" and CoffeeSensor, I'm still not sure. It is interesting seeing the momentary spikes in temp (especially high) but I'm still experimenting with whether these can be minimised. This is most evident flushing between shots and flushing trying to speed heat-up. "TheBat device" on the left, "Eric's device" in the middle, "CoffeeSensor" on the right. Summary of pros and cons (in my opinion). The attached PDF is the earlier version of the manual for Eric's grouphead thermometer. Determinig the correct insert depth for his thermometer is discussed on page 8 and is applicable to all grouphead thermometers I'd imagine. It's also what I used as a guideline when installing "TheBat device" and the "CoffeeSensor" and avoids creating an undue flow restriction in the Brew water path. This is especially relevant with the larger diameter probe/thermowell tips of TheBat and CoffeeSensor. Eric's thermometer is the only one of the three which has the actual thermometer tip exposed to brew water. This PDF will ask to be saved to your local drive. Couldn't work out how to attach it as a view and not download PDF. Last edited by CafeLotta; 11th November 2018 at 09:51 AM. I've had Eric's grouphead thermometer installed permanently for about 3 months now and thought I'd post an update. As mentioned previously it is the most sensitive of the 3 grouphead thermometers I tried as well as the most expensive. With each of the thermometers there is a learning curve and switching from TheBat device to Eric's thermometer was almost like starting over again due to it's greater sensitivity. The readings spun through quicker and reached higher and lower readings as temp spikes were displayed. These spikes weren't displayed on TheBat device due to it's slightly lower sensitivity. This could be viewed as a good thing in a way as it lead to less confusion in interperating readings. I can only comment on my observations in regard to a single boiler E61 machine. Eric's device will remain permanently mounted on my machine as I like the solid and quality feel of the unit as well as the added sensitivity. If price isn't a big issue I'd give it a big thumbs up. If price is a consideration I found that both TheBat device and CoffeeSensor were on par in regard to sensitivity. I used TheBat device for a few months and found it invaluable. I really can't see how any non-PID E61 single boiler would manage tight temperature consistency without a grouphead thermometer to guide the brewing process. Might explain the demise of E61 Single Boilers. If Grouphead Thermometers were standard equipment on them it may have helped unlock their full potential. Even PID versions might benefit from monitoring actual E61 grouphead temperature between shots and initial heat-up. Alot has also been written in regard to the usefulness of grouphead thermometers on Hx (Heat Exchanger) machines. FWIW what you are calling sensitivity appears to be response time, in metrology these are different things: sensitivity refers to the minimal difference in the measured quantity that will cause the instrument reading to change. Sounds about right. Eric's thermometer has had the probe housing the sensor manufactured to a minimal wall thickness aiding heat transfer between the brew water and the sensor. The quick response time is very obvious when compared to the other 2 thermometers I tried. Not entirely necessary but can be of use if you so desire. This has been useful to me when I have played around with seeing how venting some steam through the steam wand between shots affects temp stability during the next shot. On my single boiler I can actually tighten the temp variation a little during the shot (to <1 deg C, at times 0.5 deg C). I've also thought I might play with opening the steam valve a little during a shot to play with pressue (profiling a bit like a paddle?) and see what it does to temp during the shot.